Doing paintings of flowers are both fun and very challenging! I like flowers that probably is one of the reasons I studied horticulture in college. I enjoy planting them and working in the flower garden. They get their photos taken, then I paint their beautiful blossoms, so I can enjoy them all year. I always look forward to springtime with all the flowers blooming. We have an azalea plant in front of our house that blooms every spring with white and pink flowers on the same plant. 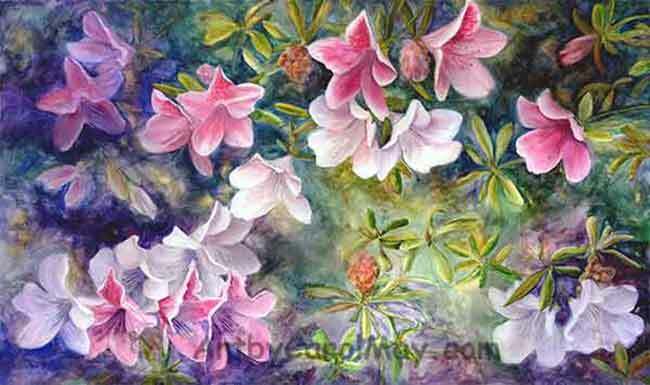 So here it is recorded forever in “Azaleas”. The southern magnolia tree has large flowers compared to many other flowers. And they have a wonderful lemony fragrance. 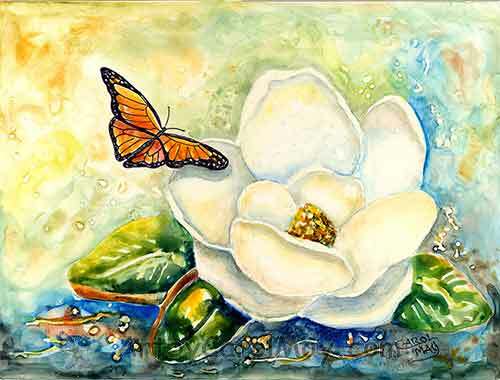 Here is a butterfly visiting a Magnolia flower. 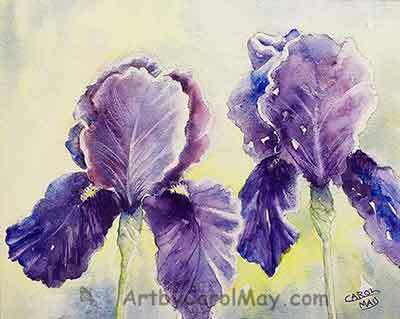 I painted these "Bearded Iris" plus some Coneflowers and Poppies all with watercolor paints. 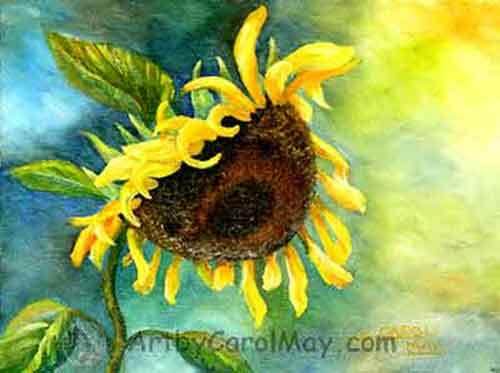 See how I did these paintings of flowers. When I started teaching horticulture I found orchids in the class greenhouses. I quickly became infected with the orchid bug. They are so beautiful. 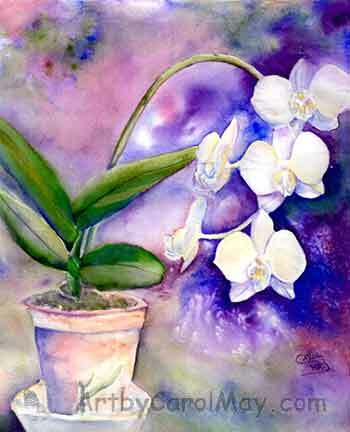 Orchids are found in every country of the world. Some of them like the Phalaenopsis have flowers that last for months. When the wild Phalaenopsis orchid was first found in the jungles, they were seen at a distance and the explorers thought that they were a group of white moths flying. Here are some phals in “White Flight”. "Doritaenopsis" is a cross of a Phalaenopsis with a Doritis orchid which gives the flowers brilliant colors. They are grown the same way as Phalaenopsis orchids. Why don’t you try some of your own paintings of flowers? It is challenging and rewarding. Then the flowers will last forever. 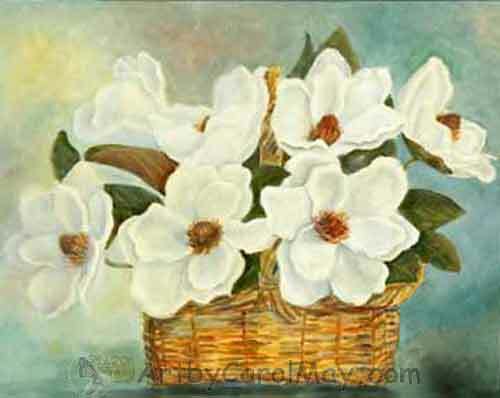 Magnolias are the flower of the south. They are beautiful with their pristine beauty. Here is a "Bloomin' Basket" of them. 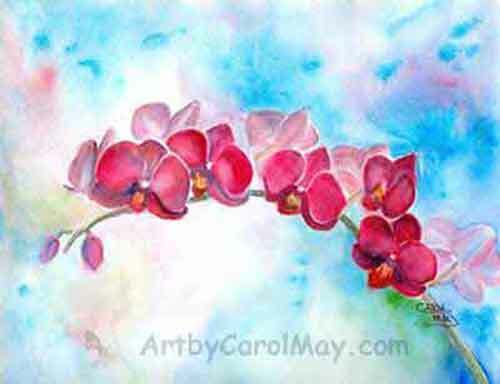 Go here for more of my floral paintings. I went out and sat down on the edge of the front porch when the Tulip Magnolia was blooming and painted it. Some people call them Japanese Magnolia. 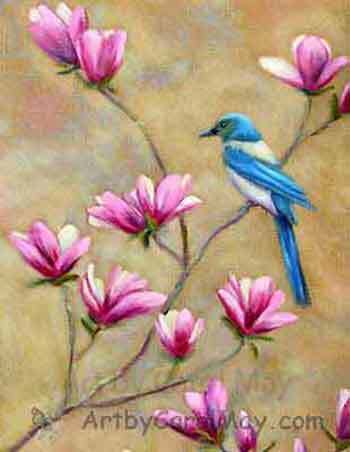 Later I came in the house and added the blue Scrub Jay for the "Scrub Jay on Tulip Magnolia". What a lovely compliment they are to each other. Daisy flowers have been one of my favorite flowers ever since I was a child. So naturally, I had to paint them. I did them in a porcelain vase on a mahogany table. “Daisies ‘n’ Porcelain”. These giant sunflowers grew in my garden one year. When the seeds were ripe the birds would sit on the back of the flower. Then they would lean over and peck the seeds from the front of the flower. The Son's face is shining down on us. "Son Shine"
Painting roses is a challenge. And I am still learning. 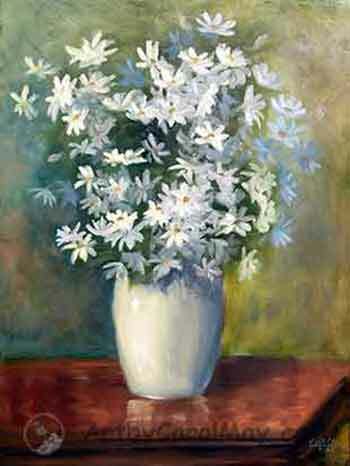 But this painting of flowers is not so much about the flowers, as it is the "Cologne Bottle". This cologne bottle is from my teen-age years when my sister and I had these bottles sitting on our dresser. One had rose fragrance cologne and the other one had apple fragrance. I had so much fun drawing and painting it. When I got a little older, like everybody else, I learned to love roses. 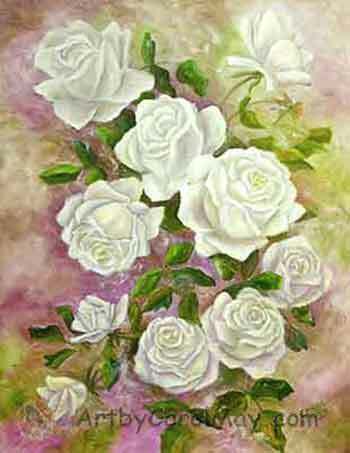 Here are ten white roses signifying “Peace”. 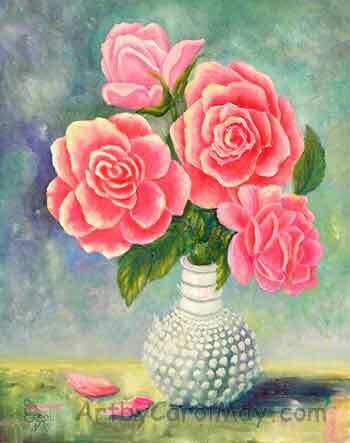 What a lovely painting of flowers! 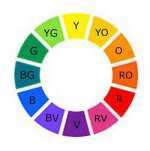 View more of my paintings. I like watching the birds as much as I enjoy growing flowers. 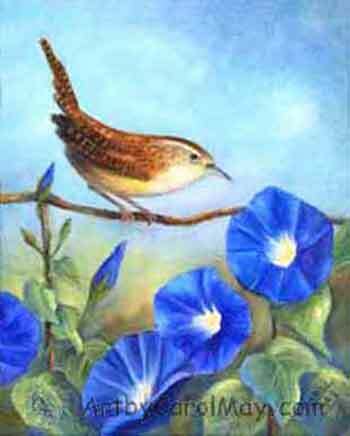 The blue Morning Glories with a wren made a lovely critter and flower painting.